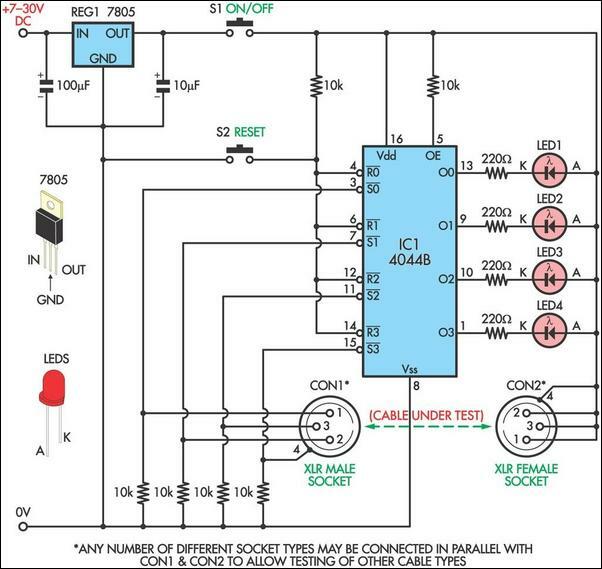 This circuit was designed to allow microphone cables or other cables to be easily tested for intermittent breaks that can often be difficult to find using a multimeter. The circuit can test cables with up to four cores. Both switches used in the circuit are momentary contact push-buttons and it can run from a 9V battery, in which case the 7805 regulator can be omitted. To test a cable, connect it between the two sockets and press switch S2 which resets all four latches in IC1, setting them low. This turns on all four LEDs. A good connection for each core of the cable will mean that the relevant Set inputs of the latches (pins 3, 7, 11 & 15) will be pulled high and the appropriate LED will remain on. A broken connection in the cable will result in the relevant Set input being pulled low by the associated 10kΩ resistor and the so the LED will be off. Because the circuit latches, it is easy to pinpoint even the smallest breaks by simply flexing and twisting the cable up and down its length until one of the LEDs turns off. To test different types of cables, simply connect appropriate sockets in parallel with or in place of the XLR sockets.